It's a mark of how extraordinary a step Darwin took on humanity's behalf that a principle that seems so straightforward and uncontroversial today – that random mutations would make some species better suited to their environments than others, and that those species would be more likely to breed – could have caused such extraordinary upheaval as recently as 1859. Still, that's what happened. Except that competition between species wasn't Darwin's key idea. As Peter Bowler points out in his excellent Evolution: The History of an Idea, Darwin focused on competition between individuals within a population, not on competition between species. Alfred Russel Wallace came much closer to the latter idea, possibly envisioning competition between subspecies as the driving force behind evolution, though there is no absolute statement to that effect in his original paper. Darwin did allow for such competition as a source of divergence and, eventually, speciation, but to him the source of evolutionary change was competition between individual organisms. On the other hand, Mr. Bland avoids a common mistake by crediting Darwin's recognition of the variation in mockingbirds on different islands in the Galapagos as Darwin's crucial early insight, not, as many suppose, the variation in "Darwin's finches," a legend that Darwin himself contributed to in recounting his visit to the islands. What if you designed a poster on Darwin to celebrate his 200th anniversary? What would you recommend to include? I might make one-- but having a poster of Darwin, the word Evolve and two mockingbirds slightly different from each other would fly over most people's heads. A tortise for one thing. As the Beagle was about to leave the Galapagos, he was told by Nicholas Lawson, the British resident official, that each island's tortises had differences in their shells so that their origin could be determined by the shell alone. That supposedly got Darwin thinking about what other species might show such differences, leading him to the mockingbirds and, once home again, the finches and, from there, to biogeography in general. But the point of the tortise might fly over most people's head as well and just be viewed as a bit of exotic fauna that he encountered. I'm afraid that most people (in the US, at least) are so ignorant of Darwin's work and history (not to mention evolution in general) that iconography will be lost on them. Oh woe, John, he heard that bit long before he was leaving the islands. He was told about the tortoises when they reached the second island they visited, Charles Island, by Lawson, the acting Governor of Galápagos, who happened to meet them when they arrived. But back to errors in the article. It is of course very questionable whether the announcement of natural selection "up-ended the contemporary orthodoxy", as his main impact was in making evolution scientifically respectable, even though many of his supporters disagreed with the significance he placed on natural selection. Asa Gray would take issue with "eliminating God from science", though eliminating control of science and science education by the clergy was Huxley's aim even before Darwin published his theory and gave Huxley ammunition for the fight. The comment about "shooting, dogs and rat-catching" is in Darwin's autobiography as something his father once said to him, in the context of his schooldays. No indication that I know of that his father wrote it to him at Edinburgh, as the article indicates. Darwin wasn't "on a divinity course at Cambridge", he was enrolled for an ordinary BA as the basic requirement for clergymen, who then did a divinity training after gaining the BA. He was diverted by the Beagle journey, and never did that training. 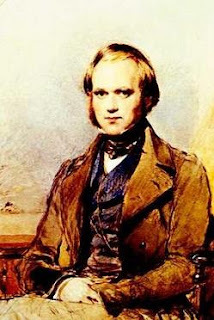 It's misleading to say "Darwin joined the HMS Beagle as the ship's naturalist", he was a self-funded gentleman naturalist given the opportunity to use the facilities of the ship, though he did become the de-facto main naturalist on the ship and onshore. And of course it's "the Beagle" or "HMS Beagle", don't they teach these journalists to write in English? While the mockingbirds were important, the first writings suggest that the rheas were at least as significant, and seem to appear in his thoughts more often. The fossils also play a big part. The evolutionary tree is significant, but it's hardly "the first surviving record of his insight". It was preceded by his note during the last lap of the voyage that "such facts undermine the stability of Species", and by the various points in his Red Notebook which include "one species does change into another", and in the "B Notebook" by discussing variation in offspring "to adapt & alter the race to changing world", as well as small sketches of branching descent. And in 1859 he wasn't really ready to publish, but felt pushed into putting out that rather famous abstract... but that's enough for now. Oh woe, John, he heard that bit long before he was leaving the islands. You're probably right. I was going by memory on that point (always a dangerous activity), perhaps enforced by by the fact that Bowler's account of the incident is one of the last things he discusses about the Galapagos visit. About the rest, I'd give natural selection more prominence. It certainly was the focus of the scientific criticism of the Origin, along with complaints about his not sticking to the then-popular version of induction. Asa Gray might have been able to accomodate evolution into his theology but it is fair to say Darwin was eliminating the most prominent place God had in science at the time: the design argument. Otherwise, I think you're correct.